Meet your 2018 National Youth Board members- Kaylee! USPC would like to highlight the National Youth Board Members for the current term. Today we would like to introduce Kaylee. Kaylee is a current member on the National Youth Board and serves as the Social Media Coordinator for NYB. 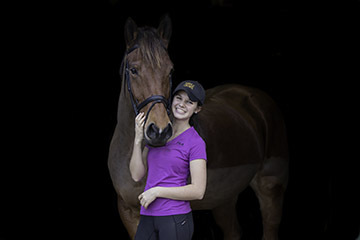 She is an eventer and has been riding since the age of four. Currently she has a retired warmblood, perfect Haflinger pony, and a lovely four year old OTTB. Kaylee is from Mount Vernon, Ohio but currently attends Asbury University in Wilmore, KY. She is a Junior and studying marketing with an emphasis in sales. Joining USPC has been one of the best decisions of her entire life and she is thrilled to be giving back to this wonderful organization that has given her so many opportunities. She is currently a C-3 Traditional, C-3 Dressage, and HB member with the intentions to test for her HA and B Traditional this summer. Aside from horses, she is an avid coffee drinker, dark chocolate consumer, and loves anything that involves an adrenaline rush! Meet your 2018 National Youth Board members- Brittany!